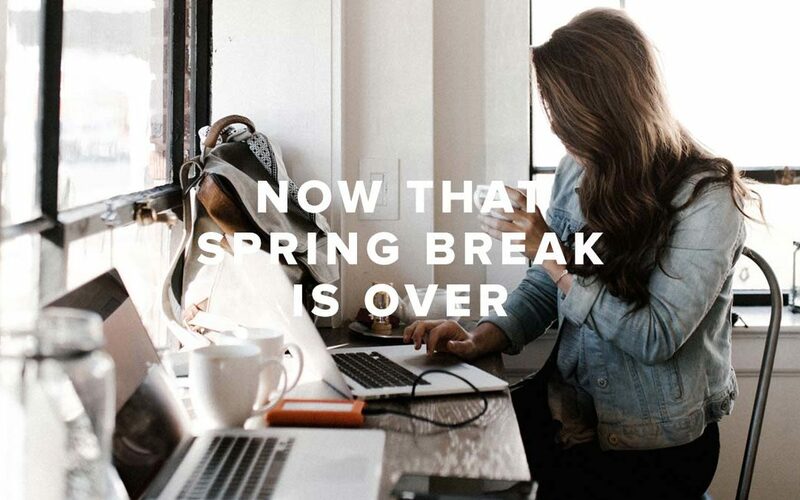 It’s the break we all wait for–Spring Break! That final break between Christmas and the end of the school year, and now it’s over. For some of us, we’ll get a touch of summer fever or senior-itis and just phone it in for the next couple months until school is out. And I’m not even talking about kids! For my wife and I, we feel like its a sprint to the end of school and a lot of things can fall by the wayside until June. Yet, the final 8 weeks of the school year can be a great opportunity to set you up for an even better summer. Many of us thrive on structure and routine, and kids especially benefit from rhythm. Take some time to reestablish what you may have had in February and March. This can include set bedtimes, homework time, amount of tech time, family time and certainly God time. Moses instructs the people of Israel to remind their kids to love the Lord their God with all their heart, soul, mind and strength. And he says to remind them when they wake, during their day and before bed. Take a few moments each day to put a scripture in your kid’s lunch or talk about “How you saw God work today” over dinner or pray before bed. Don’t forget about making church a part of your weekend. Sowing seeds in the spring will produce a harvest in the fall. While you may already have a camping reservation, airline tickets or a cruise booked, consider some goals. What would be a “win” this summer? More family time–define how much. More service projects in your community–define how many. Daddy /daughter dates–when and where will that be? Another good thing is to start putting together a reading list. Before you end up on a beach looking for something to read and settle for the latest issue of People, have a good list of books to read. Some fiction, some non-fiction. And as always, good prep for the summer is to save some money for what you’re about to spend. Coming home with no debt is better than returning with more. This is a good chance to remind your kids the value of end the school year running rather than limping. I always remind my kids don’t just break the tape, run through it. Set up some goals of finishing all work, raising grades and walking out with your head held high. 4. Set up online giving. This may seem odd, but with all of our traveling, we often forget about the charities that we fund. Whether it is church, your school or your favorite non-profit, set up recurring giving so you don’t miss a beat–and more importantly, neither do they. 6. Take care of graduates. Don’t forget there are people you know who have kids graduating and headed off to school. Prep now for a gift that will be helpful for them. Rather than a life lesson book they’ll never read, think about a gift card or something helpful for their new life in a dorm. 7. Say thank you to teachers. Coming from a guy who’s married to a teacher, most gifts for teachers are purchased on the way to the final day of school. Maybe ask ahead of time, “what’s your favorite restaurant or home store?” And while a handmade picture frame seems like a good idea at the time, in a few years, what will the teacher really do with that? 8 weeks left. Let’s make it good. Then really enjoy the summer!